Across Minnesota, local agencies need better information about where and how many people are biking and walking to make decisions about infrastructure investments, understand safety risks, and even plan active living initiatives. 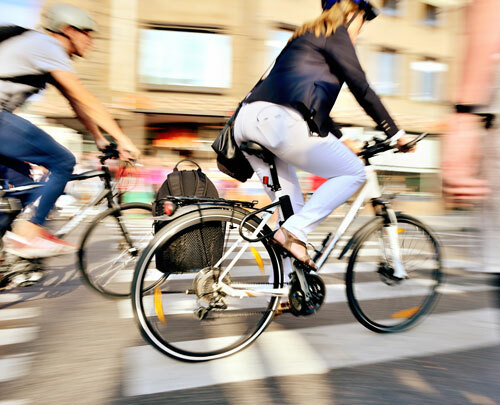 To help provide agencies with bicycle and pedestrian traffic data, U of M researchers have been working with the Minnesota Department of Transportation (MnDOT) on the Minnesota Bicycle and Pedestrian Counting Initiative since 2010. The initiative is a collaborative, statewide effort to support bike and pedestrian traffic monitoring by local, regional, and state organizations. Recently, the project team completed an implementation study—the second of three MnDOT-funded projects related to the initiative—specifically designed to engage local agencies. The goal was to demonstrate the feasibility of using both permanent and portable sensors to collect bicycle and pedestrian traffic data in several Minnesota cities, suburbs, and small towns. To that end, the team installed commercially available sensors—including inductive loops, passive infrared, pneumatic tubes, and radio beams—to collect traffic counts in several Minnesota cities. Overall findings indicate that all of the sensors produced reasonably accurate measurements—and that participating agencies found value in the collected data. Findings and case studies from the study have already been incorporated into the draft Bicycle and Pedestrian Data Collection Manual, a new MnDOT guidance document being used in statewide training workshops. Also as a result of the study, MnDOT plans to include commitments to bike and pedestrian traffic monitoring in its forthcoming statewide bicycle and pedestrian plans. In addition, MnDOT is investing in a network of permanent traffic monitoring sites around the state as well as in portable equipment that will be available to local agencies. Read the full article in the September issue of Catalyst.